The temperamental weather of the previous day dissipated and we were finally able to see what all the fuss over this national park was about. 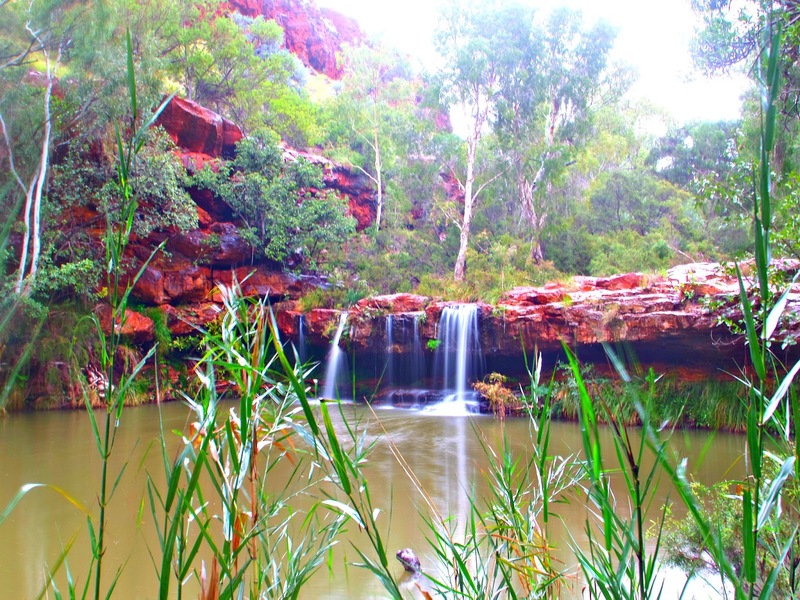 Karijini covers an area of around 1,500,000 acres so you need at least three good days to make the most of it. We headed to a spot a few kilometres east of the visitors centre with a few short walks to wake up our legs which had been taking it easy for a while. The walks are all graded on difficulty so even people with limited mobility can pick the trail which suits them. The only place where the rangers seem to get it wrong is with the estimated time the walks should take. The first lookout was only 500m away, yet the sign stated a twenty minute return. COME ON! I don’t know how much dawdling Australian tourists do but I’m pretty sure most people could beat that time even if they were spun around until dizzy, told to walk backwards and had their shoelaces tied together. In fact make it a new game. If you go to Karijini or any national park in Australia for that matter. Try and see who can get the closest to the estimated time to complete a trail and while you do it act like you’re walking normally. I bet you end up getting right weird looks from other hikers as you waddle like a severely constipated penguin. Naturally we opted for the toughest one on the list which was only a medium difficulty trail (3km so probably advised to give a fortnight to complete). Nothing too challenging but it would require some clambering and climbing over slippery rocks. The first phase took us via a number of viewpoints of Dales Gorge and even on a slightly muggy morning the view was incredible. 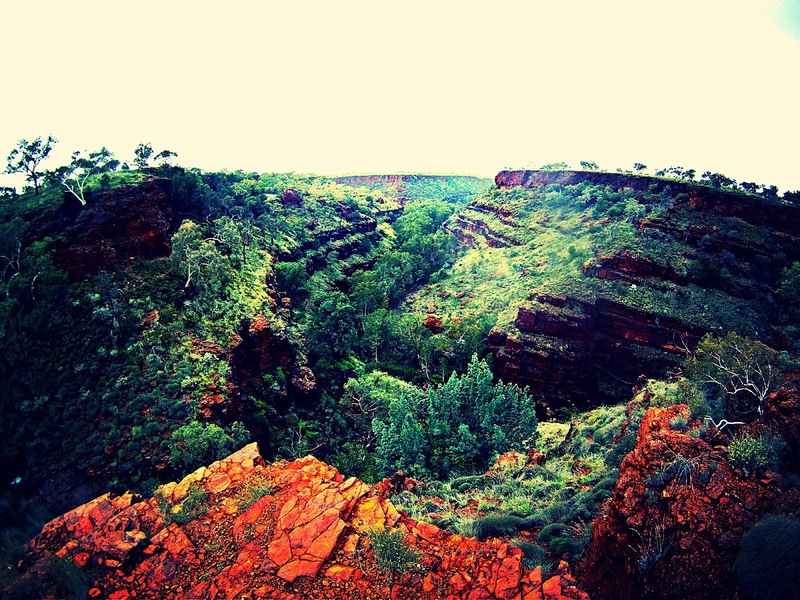 The lush vegetated, rolling hills and troughs suddenly give way to the immense cliff faces of banded iron with the odd blue white vein of asbestos. Wandering down the canyon wall for a few hundred meters we reached the river and in a landscape such as this that meant waterfalls. Fortesque Falls isn’t the most spectacular we have seen but at least the contrast between orange rock and the crystal clear liquid was pleasing on the eye. It’s a shame the sun never showed itself as I think that would have amplified the view tenfold. None the less this didn’t dampen Jono’s spirits and as I tried to find a good view for a photo he took and much needed swim in the freezing water. Beyond the falls is the aptly named Fern Pool. The still pond is another great swimming spot made nicer by the lush plant life and overhanging paper bark trees. 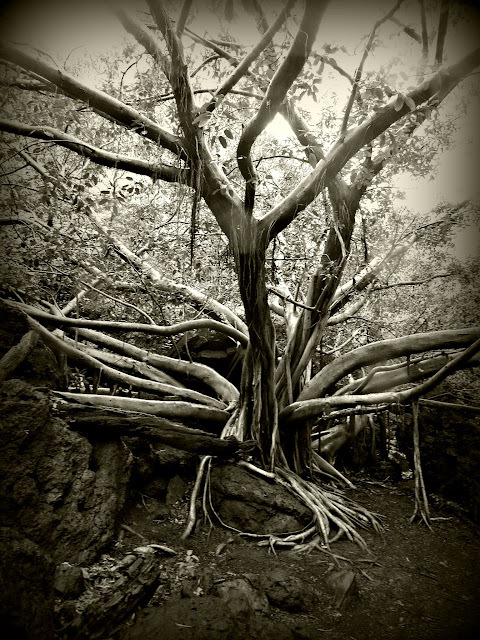 The paper bark trees seem to sprout directly out of the bedrock and due to the enclosed surroundings some acquire some unusual stances. Like many of the trees in this part of the world the bark peels off over time to encourage passing bush fires. Unlike the commonly seen eucalyptus however the paper bark can be peeled off in sheets, hence the name. We collected some bark as it would provide good tinder to get a fire going in the damp weather. All I need now is a decent knife, a desire to drink my own urine and legal document changing my name to Wolf Grinz and who knows I might just get my own TV show. All in all a good day well spent. Once again sods law prevailed in double measure as even by our standards it properly pissed it down. 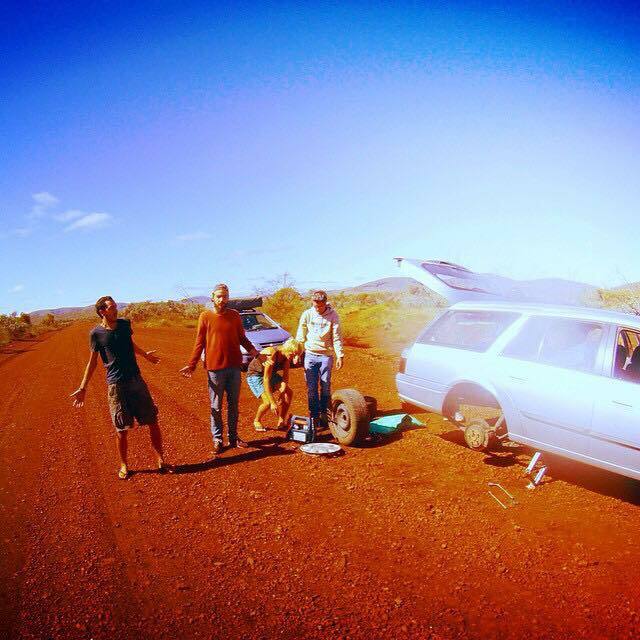 With the nearest petrol station in Tom Price on the other side of the National Park every decision to leave the camp was a calculated one and with no prospect of a nice walk we decided to have a lazy day and sit tight. Naturally our food and beer supply took and beating but at least with the free Wi-Fi we were able to check the forecast for the next few days and it predicted a noticeable improvement. Thankfully the weather people were right and the weekend brought the sun out. We left the free camp site behind and headed to the visitor centre hoping that we would be able to get into the heart of the park. It seemed luck was on our side and the gravel track had been reopened to the public. Many of the visitors had decent 4x4 vehicles which could tackle the trails no problem but despite our optimism Dave and Dustin assured us that they have driven their two wheel drives along much worst roads. Naturally this discussion meant we had tempted fate and 800m along the track Dustin’s Ford Falcon (which we were in) had a puncture. Normally this wouldn’t be a big issue but as you will recall Dustin had been trying to find a cheap spare a few days prior as his one already suffered from a slow puncture. Sadly there was little option but to use the slightly hampered spare until we could get a replacement. The cost of recovering a car out here is not worth thinking about unless you are a lottery winner so very tentatively we crept along with our fingers crossed until we reached the next bunch of sights 25km away. Hampered by the puncture we focussed on a number of quick viewpoints and photo spots close to the road and car parks. This would mean an overnight stop at the pay to stay eco lodge but at least it would give us a full day to do some decent hiking. Like the gorge on Friday all the viewpoints are spectacular with their own characteristics. 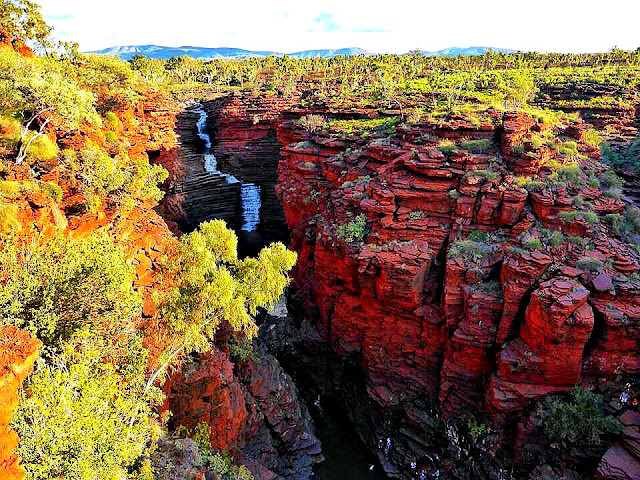 Joffre Gorge was the highlight with its large waterfall tumbling over the polished banded iron staircase but there are also viewpoints of Knox Gorge and the four canyon junction (Joffre, Hancock, Red and Weang). As evening set in we booked in at the “Eco Retreat” on the opposite side of Joffre Gorge to the viewpoint. The fee was $20 per person/night for an unpowered tent site meaning as a group we would have to pay $100. As we were trying to do this road trip on a budget it seemed a bit of a piss take. Sure the funds apparently go towards maintaining the park, but really how much maintenance does a geological landscape like this need? It’s been relatively unaltered for millennia and I didn’t see any park rangers cleaning mildew off every rock with a tooth brush. Despite the fee it is still the visitor’s responsibility to clean up and dispose of rubbish so really they were providing the same facilities as the free camp site we had stayed. Being the sneaky, money dodging backpackers we are we hatched a cunning plan. Dave and Dustin dropped myself, Jono and Bastiaan just inside the entrance and checked in the cars whilst we mingled around the grounds. After twenty minutes we regrouped and split the now $40 fee between us. It was an immaculately conceived hustle and unsurprisingly the “planet saving” rangers couldn't even muster the energy to unravel our scheme. Mostly because they were distracted by the hordes of grey nomads with pensions burning a hole in their pocket, buying stubby’s (an aluminium can in the Queen’s English. Oh yeah and that’s pronounced “alu-minium”, not “a-loo-min-um”) of piss (lager) for $13 a pop. After making the most of the Eco Retreats warm showers and still reeling over the con we headed out early to make the most of our last day in this wonderful geological oasis. Before leaving the camp site we returned to Joffre gorge on foot and climbed down the canyon side to reach the pools at the base of the waterfall. The cool waters were offered rest bite from the day’s heat which even in the morning was well on its way to hit the mid 30’s. Weirdly enough some of the Aussies had packed thermal wetsuits to brave the waters. I'm sure the concept of snow must seem like the beginning of the apocalypse to folk that think temperatures in the low 20’s means donning a woolly hat. North of the falls is Weano gorge and more viewpoints and trails. Once you descend into the Weano valley there is a great walk to the handrail pool which as the name suggests is a river walk culminating in a handrail trail leading to a waterfall. It was more of a swim than a walk but definitely worth the effort as it offers some great photo opportunities. 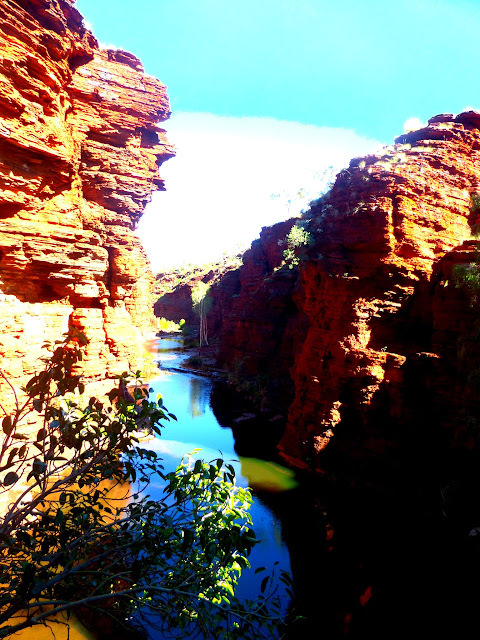 Next on the list was Hancock Gorge which runs adjacent to Weano Gorge where the walk takes you to Kermit’s Pool. 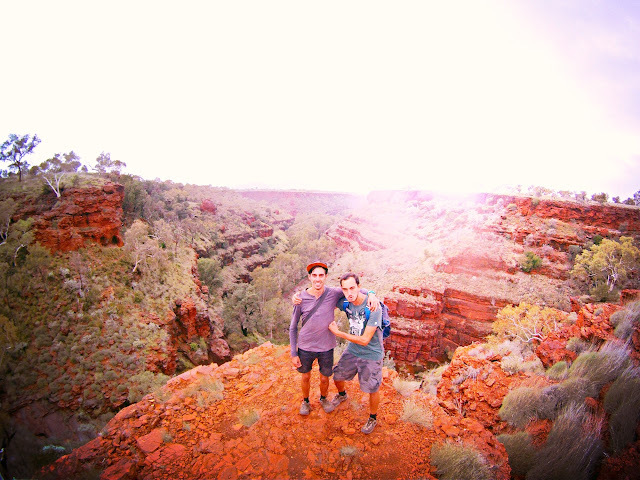 We spent as much time as we dared in the park before heading towards Tom Price. Our calculations had been almost perfect as Dustin’s car ran out of fuel a few miles out of town but after syphoning some from Dave’s Honda Getz we got to a garage eventually. 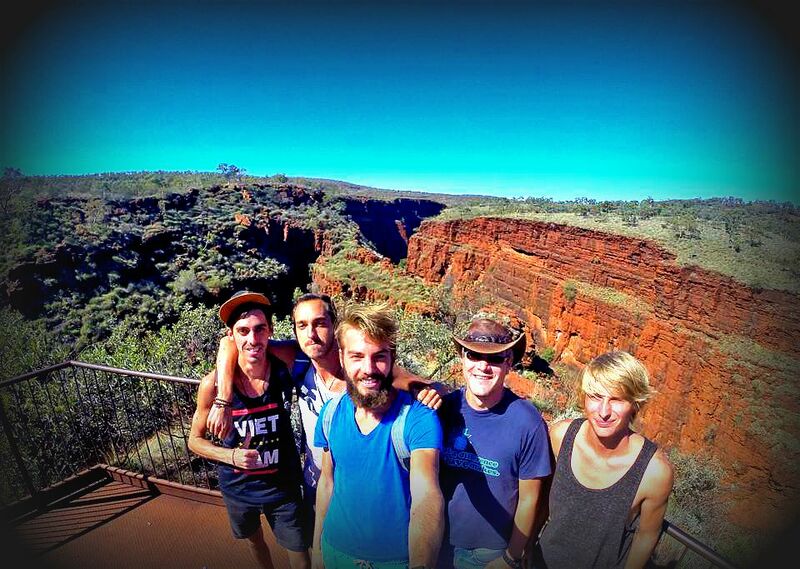 Our overnight spot was at a place called halfway bridge just outside Tom Price. It was a nice free camp site right on the river (although it was too dark to see) and there were already a few travellers setting up. We shared tea with a nice couple who lived on the road in a converted ex-military bus. They were really taking the easy rider, hippie lifestyle to the extreme earning cash as mobile hairdressers and even educating their kids on the road only returning them to school when exams are due. “I gave the kids a choice to either learn concepts and theories about language, politics, mathematics, geography and life skills in a classroom or go out into the world and experience it first-hand…. They chose the latter” he said whilst sucking on an incredibly aromatic cigarette. As eccentric as they seemed if you sit down and think about it most 9 year old's would do the same thing and it should be encouraged. If you look back I bet most of you wanted to be explorers, astronauts or pirates but the reality of later life distracts you from that desire to witness new things.